Behind the Bit: Thoroughbred study on safety: Something to be learned here? Thoroughbred study on safety: Something to be learned here? A new study, Dynamic testing of horseshoe designs at impact on synthetic and dirt Thoroughbred racetrack materials, will appear in an upcoming edition of the Equine Veterinary Journal. Not exactly light reading, but I browsed the summary article Study evaluates horseshows, track type, thoroughbred safety in The Horse Magazine. Racing is an extreme sport, but maybe the other disciplines should take notice. We ask a lot of our farriers, and sometimes expect miracles. 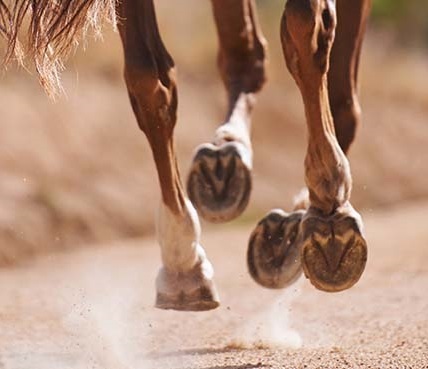 A great farrier is still a great farrier, and the hoof has to be balanced -- but in the end, the footing horses work on may have the greatest impact on a horse's soundness. Disclaimer: Nothing in the article suggests that we should extrapolate from racing to dressage, or to hunter/jumper disciplines. I just think it makes sense. This adds weight to my growing conviction that the sand footing in our little home arena has been the dominant factor in the numerous suspensory injuries my current and previous horse sustained. I don't have a watering system (or a big enough well to set one up) so in the summer the sand gets dry and shifty. My equine lameness specialist veterinarian husband poo-poos it, but I now refuse to ride in it when it's dry, instead schooling out and about in fields, vineyards, and on our gravel road.